The Hotel Castilla is internationally identified in many of the tour guides to the Caribbean, and as a result, frequently entertains clientele from all around the world. Take a look at the map to see the many countries and cities of the visitors to Sam's Bar & Grill. The hotel has the distinction of being Puerto Plata's first hotel and was constructed in the late 1890s. The restaurant has had many owners and different names. Sam is the first basset hound on the island and has been sleeping in the doorway or on the street in front since November 1995. An early New York newspaper article notes that "if 'As Time Goes By' is your song, they are playing it loud and clear at the Hotel Castilla." Hotel Castilla is located in the heart of Puerto Plata only minutes away from historical sites, numerous restaurants, and popular nightclubs. 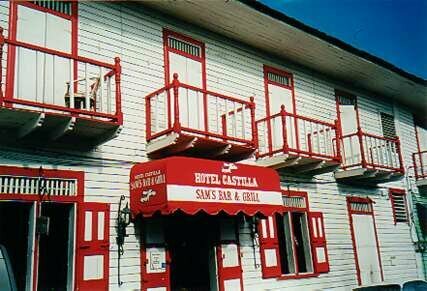 Featuring rooms with both private and shared baths, ceiling fans, available cable TV, and email services, the Hotel Castilla is the economical choice for travelers from around the world. Apartment with private bath, kitchen, and refrigerator is available for rent - email for more information.